Solar pool heating will lengthen your family's swimming season while saving you money! Swimming pools are expensive investments for your home. They contribute to your homes landscape and value. But most importantly, they provide a relaxed environment for recreation and fitness. A solar pool heating system can help you get the most from your swimming pool investment. In addition to providing more time for you and your family to enjoy the pool, it will save you money! 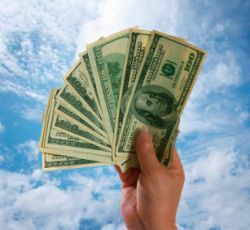 These systems will generally pay for themselves in two to five years when replacing gas or electric pool heating systems. The swimming pool water is directly heated by pumping it through a solar collector. This is the same principle that is used an open-loop solar water heating system. 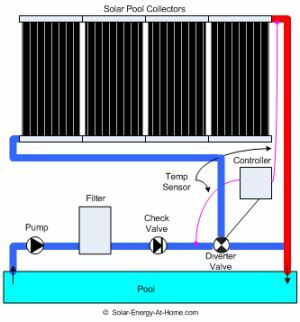 However, due to the larger volume of water, the lower temperature requirements, and seasonal use pattern, the collectors used for pool heating are simpler and less expensive than those used for solar water heating. 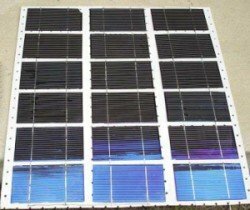 A solar pool collector is simply a black absorber plate which converts the Sun's radiant energy into heat. The absorber plate has parallel tubes, called risers, running through it. The risers are connected at each end by manifolds. The manifolds are the inlet and outlet pipes to the collector. With those components in place, you now have a solar heated pool! But, to really take advantage of this heating system, it is important to use a pool cover. Did you know that evaporation accounts for 70% of a pool's total heat loss?!!! The best way to minimize heat loss due to evaporation is to use a pool cover. There are a couple of different types to consider. The first type of pool cover is a solar blanket. These covers are similar to the bubble wrap used as packing protection. In addition to reducing heat loss due to evaporation, their transparent design helps to collect and trap solar thermal energy. This can help the pool stay an extra 5-10 degrees F warmer. This type of simple pool cover can be purchased for around $100 to $200, depending on the size needed. Vinyl covers are a second type. These are more durable than solar blankets, but are also more expensive. You can find insulated and uninsulated vinyl covers. Since they are heavier than the bubble covers, you will probably want to get a reel to help roll the cover up. This will make the placement and removal of the cover easier. This type of pool cover ranges in price from a couple of hundred dollars to over $1000, depending on size, type of cover, and type of reel. Investing in a pool cover is important if you want to get the most out of your pool's solar heating system and extend your swimming season. 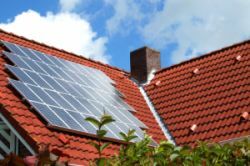 Extend your summer fun with solar heating! A heated pool increases the amount of time each year that you and your family can enjoy your pool. By using the Sun to heat your pool, not only do you increase your fun, but you decrease your costs!